This cheeky pot bellied little fella has real character and appeal - we just couldn’t resist. 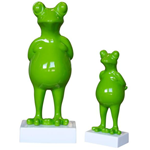 Moulded in a classic pose this Standing Frog Ornament looks great and is sold in small, medium or large sizes. The lacquered finish is applied by hand in numerous layers so it’s thick and tough to avoid chips appearing with regular handling. The polished sheen only seems to make the frog look oore cheeky. The mould itself is made using polymer fiberglass which is lightweight but hardy and produces a superb smooth finish to the final product. Friends and family will surely find the humour in this Standing Frog and won’t fail to hone in on it as a talking point at gatherings and special occasions. The tough finish remains unaffected by the elements all year round simply needing a quick wipe over with a wet cloth every now and again to restore the shine. We also sell Sitting Frog Ornaments.